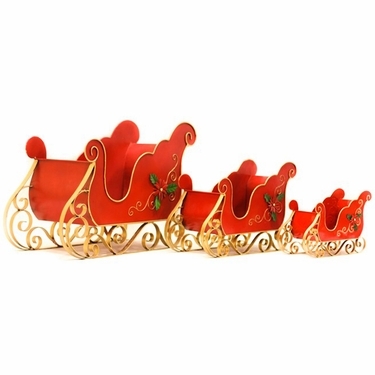 The Set of 3 Holiday Iron Christmas Sleighs are a perfect Christmas decoration for your holiday season. �Arriving in 3 different sizes with bright red & gold flair, these decoration can be used to hold presents and gifts, candy and treats, and just about anything that will fit and delight! Perfect for around the home or office, made for indoor and outdoor use. Large Victorian Christmas Sleigh "LUCIANA"